One great way I have found to interest children in science is to involve them on an individual level. Obviously many hands-on science programs and activities are designed with just this goal in mind. But I’m talking here about something that is beyond the tactile, something deeper than what students can see or smell. I’m suggesting an exploration of impulse and belief. Students really react to science, or most any other possible stimulus, when their opinions and actions matter, and have a direct effect on an outcome. Creating a personal experience often comes down to asking Why questions. Sharing science with children, rather than preaching it to them, forces them to determine their own motives and opinions—subjective states of being that underlie our behavior, but which are difficult for most children and often many adults to articulate, much less access, on their own. So how can instructors create this experience for students? Perhaps a failed example on my part will help illuminate the better process. Some years back I was enjoying a late-summer afternoon stroll with my wife along the esplanade that runs parallel to the Charles River in Boston. As we rounded a bend, we could see a flurry of activity up ahead. It turned out to be a fairly common urban scene of predation: A Red-tailed hawk had attacked a squirrel and was trying to finish it off. But there was more to the equation. Two boys had come upon the scene themselves and were in the process of tossing rocks at the hawk, who was now perched on a low branch of a nearby tree while the wounded squirrel struggled on the ground below. As someone who has studied natural history and understands the principle of predation, the boys’ behavior bothered me immensely. But I didn’t handle it well. I simply blurted out “Hey kids! Stop throwing stones at that hawk. Leave it alone.” I then stood there and waited for them to end their assault before continuing on my way. This, of course, was an opportunity lost. Instead of chastising these children I should have taken the opportunity to teach them something. Not in a pedantic and preachy way, but by asking them to examine their own actions. After all, like myself those boys had simply chosen a side, and were ardently supporting the creature that they cared for. 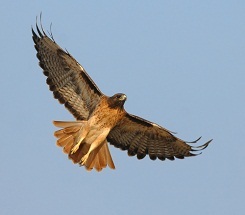 In that moment, the hawk seemed like a vicious bully, intent on hurting a helpless animal. I could, and should, have addressed them with questions. If I had first calmly asked the boys what they were up to, and then continued to ask them why they were doing it, I may have been able to get them to process the reasons behind their instinctive reactions. At that point I would be able to talk with them about the hawk’s role as a predator—the role that makes the squirrel population a stronger and more vibrant one by weeding out sick or weaker individuals. Would my effort have ultimately saved the hawk from a shower of stones? Perhaps not. Would it have made a definitive case about right and wrong, one way or another? Fortunately, making that determination isn’t really the point. The important aspect of the encounter would be actively engaging the boys in these thought processes. In the end, it is one of the best ways to claim and then retain the interest of children in science and the world around them.